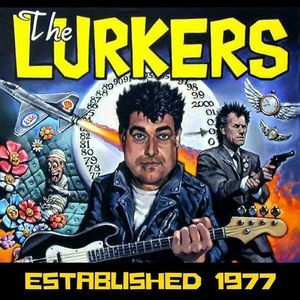 The Lurkers formed in West London in mid-1976, playing their very first gig at Uxbridge Technical College in December of this year, supporting Screaming Lord Sutch to an audience of just ten. At a time where American bands, such as the Ramones and the New York Dolls, the British beat boom of the sixties and Glam Rock acts like Slade and Sweet, the band quickly forged their own identity by taking on some inspiration. It is this unique brand of punk tunes, with lyrics encompassing subjects such as social unacceptability and personal politics, which launched them as one of the pioneering punk bands to play live in the first few months of the now-legendary Roxy Club in London. The initial line-up consisted of Pete Stride on guitar, Pete 'Manic Esso' Haynes on drums, vocalist Howard Wall and Nigel Moore on Bass. After playing just a handful of gigs, Nigel was very soon replaced by Arturo Bassick, becoming the line-up we are most familiar with. The band went on to support the Jam in February 1977, Eater in March and Slaughter and The Dogs in April. By the time of the punk heyday of 1977, the band had built up a huge and loyal following, and were signed to Beggars Banquet Records, through whom their debut single, 'Shadow', was released. This single was voted by John Peel listeners as the twelfth best track of 1977's Festive Fifty: The B-side, 'Love Story', voted at number 31. The Lurkers recorded four sessions at Maida Vale 4 Studio for John Peel at BBC Radio 1, and appeared on Top of the Pops, as well as various other media shows. Arturo played on the track 'Be My Prisoner' on the 1977 compilation album, 'Streets', of early UK punk bands from a variety of independent labels. After recording the second single, the B-side written by Arturo, 'Freak Show' / 'Mass Media Believer', Bassick left the band to form Pinpoint, and was replaced by former Saints member, Kym Bradshaw, who then himself left before recording the third single. Nigel Moore returned for this recording: 1978s 'Ain't Got a Clue' / 'Ooh!, Ooh! I love You', which was their biggest hit, reaching number 45 in the UK singles chart. The following month, the band's debut album, Fulham Fallout, reached number 57 in the UK albums chart. In January 1979, their fifth single, 'Just Thirteen' was released, which in 2001 was included in Mojo magazine's list of the best punk rock singles of all time. Their single 'I'm on Heat' was included on a compilation from Polydor, '20 of Another Kind', which reached number 45 in the UK chart, and 'Out in the Dark' was later featured on the second volume. Their second album, 'God's Lonely Men' was not as successful as their debut. Due to changing musical trends, and the record company focusing on new signing, Gary Numan, The Lurkers called it a day in 1980. Still, just two years later in 1982, Stride reformed the band, signing to Clay Records, a Stoke-on-Trent based label who worked with GBH and Discharge. With Clay, they released four singles and one album, 'This Dirty Town', then calling it a day again in 1984, when lead vocalist, Mark Fincham, ran off to work the drag clubs of Berlin. This was not, however, the last we would see of The Lurkers, as in 1987, Arturo had a chance meeting with the hugely successful German punk band, Die Toten Hosen, and discovered that they were Lurkers super-fans, willing to finance a comeback album. 'Wild Times Again' was released in February 1988, launching The Lurkers once again back onto the live punk scene. The album featured Arturo Bassick on vocals, Nigel Moore on bass, Pete Stride on Guitar and Dan Tozer on drums, although the album credit was, out of loyalty, given to Esso, despite his return to the band for just the one gig in 1987. This friendship with Die Toten Hosen saw The Lurkers supporting the band in huge stadium gigs across Europe, Arturo himself coordinating the Hosen's 1991 'Learning English' album in London with a series of well-known punk artists of the time. Nigel left in 1993, followed by Stride in 1994, leaving Arturo as the last remaining member of the 1977 line-up. Since this time, the band have continued to tour, not only regularly all over the UK, but also throughout Europe, Brazil, and Japan, amongst other places. The line-up has changed several times since 1987 to date, largely due to Arturo's somewhat nomadic tenancies and the necessity to recruit members within his locale. In recent years, Nelly (The Fiend) on drums and Billy Gilbert (Chelsea) on guitar played many Lurkers gigs, including supporting a 14 day Buzzcocks tour: later with Dan Tozer on drums, then Craig Casson (1977) on drums and Steve Racket (Hi Fi Spitfires) on guitar. The latest change in the band happened at the end of 2017, when drummer, Stuart Meadows, who joined The Lurkers in 2014 having played for Poundaflesh, Chimp Biscuit, English Dogs, The Moonthings and March to The Grave, decided to focus on drumming for 999 and Conflict from time to time. In spite of the interchangeable membership, one constant has always remained, Arturo Bassick. Whilst the legacy of the band is primarily rooted in their late 1970s works, which are considered classic examples of UK punk, it is largely Arturo's witty, outgoing, cheeky, 'has-time-for-everyone' demeanour that may people think of when they consider The Lurkers. The band continue to perform on a regular basis at assorted venues around the UK and Europe, and are typically considered 'staples of the scene', as are 999, for whom Arturo also plays bass, at the many larger punk festivals that take place annually.